request by the M-Bus Master with the last answer telegram. Because of the configurable whitelist it is of course possible to run several RelAir R2M in one M-Bus network. Due to the integrated mini USB interface the RelAir R2M can also be used as a full operational Wireless M-Bus Master, which e.g. in combination with MBSheet enables a read out. Our new gateway works without an external power supply and is either supplied from the M-Bus (5 standard loads) or via the USB interface. 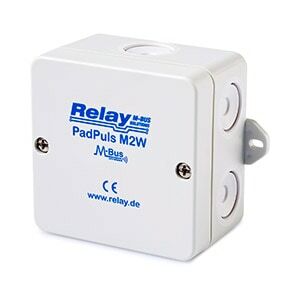 An elegant white wall housing or a better protected distribution box and an internal or external antenna are the options that make the RelAir R2M fit for the different applications.